More about iittala Toikka Mother & Baby There's nothing like the love between mother and baby, and Oiva Toikka perfectly captures this beautiful bond in mouth-blown glass. 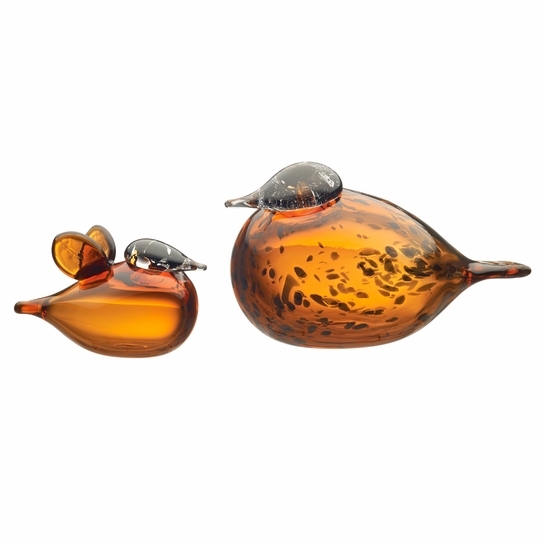 This special set makes a thoughtful and timeless gift for your own mother, child or any Toikka bird collector. While both pieces are handcrafted in the warm hue of iittala's 2015 color "Desert," each has its own unique detail; the mother carries beautiful brown specks throughout the body, while the baby dons a darling pair of back wings eager for flight.Each one-of-a-kind iittala Toikka Mother and Baby is handcrafted in Finland by iittala's master glass blowers and carries �O. Toikka IITTALA" on its base to ensure authenticity.